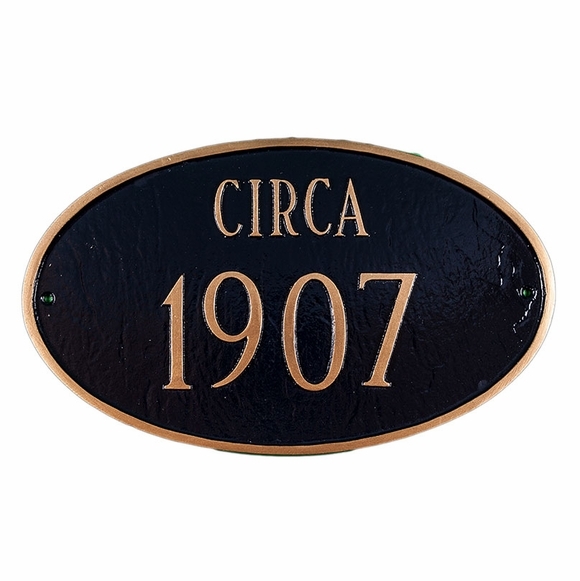 Personalized Historic Building Plaque - - Circa historic oval plaque. Made in USA. Wall mount or lawn mount options. Displays the historic year in 3" characters. Top line can read CIRCA, BUILT, ESTABLISHED, or FOUNDED. Custom made with the year desired and color scheme selection. Available with or without one optional lawn stake. Built, Established, Founded, or Circa historic plaque with year in large 3" numbers. Solid cast aluminum construction. Characters and border are part of the sign, not added on.